I had only been to Khaosan Road once before and while I didn’t remember it fondly; I could recall that it certainly was not jammed with people as this time. It was 10 minutes past 12AM and I was restlessly waiting my friends at the corner of Dang Derm Hotel. The street wasn’t change much and every minute it kept pulsating mass of humanity. 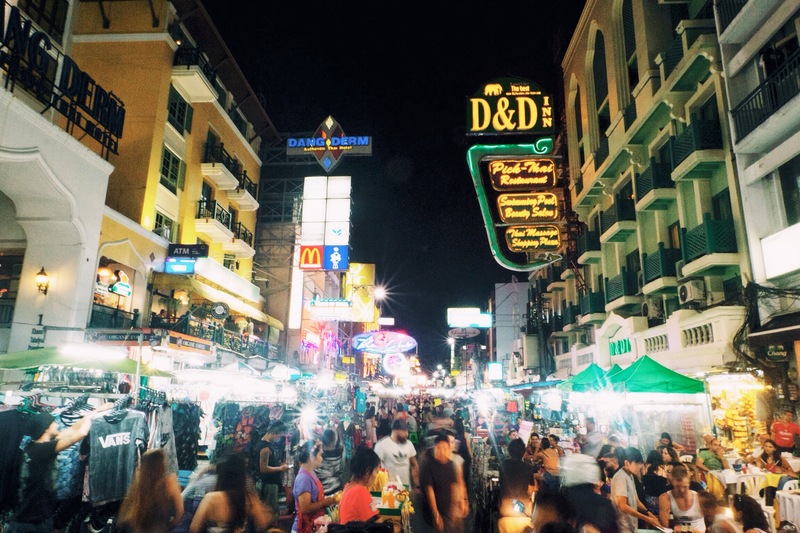 The bustling and loud night in Khaosan Road! I turned and found a middle age guy in a bizarre orange button down shirt smile at me. “Do you want a tuk-tuk ride? Real Bangkok experience!” He continued. “You are my friend, I give you cheap price. Come!” With what seemed as limitless effort, he tried to lure me into a line of tuk-tuk that was tucked into the scenery of tight-knit Khaosan area. “NO, thanks” I answered boldly. I walk out to the middle of the road and look both ways, trying to determine where will be my next stop as my view was kept blocking by train of people that either stops to buy something or trying to find an answer of probably the most difficult question in their life tonight: Which bar to choose? Both side seemed similar, line of bar with loud music and neon light crisscrossed small stalks selling various things from foods, pirate DVDs, tattoos to fake ID. Although it was vibrant I couldn’t sense a real genuineness, as everything seemed artificial. The persuading smile, the friendly hug or even the straight face of a woman who asked me to pay 10 Baths for snapping photos of deep fried cockroach and scorpion that she offered me! Everything is moving fast-forwardly in Khaosan Road including its own history. Only in few decades, what was a quiet street for centuries is emerging as the mecca of backpacker from around the world. Cheap food, cheap accommodation, cheap beer, all are a trinity most traveler worship and Khaosan Road provides that for just a few bucks. This utopia of night-crawler claimed can rub shoulders with Amsterdam, London or Madrid’s night scenes but far cheaper. Khaosan road is a great place to be young! For most of the traveler the night at Khaosan Road was a night to remember, it’s where the sinner met the lover and everything in between was nothing but sweats, lust and laugh. I walked the full length of the street, snapping some pictures and stopped at what seemed as the busiest foot massage service in town. For 120 Baths, someone was happily give me 30 minutes foot massage while other tourists that were meandered down, now stop and watching. Definitely not as what I have been imagined will be my first Thai massage experience. I joined my friends at Gazebo Club, the spacious rooftop bar felt like Oasis in the midst of congested road. The wee hour was just started and I found myself caught in a discussion about ongoing proxy war between Saudi Arabia and Iran, which definitely not the best topic for discussion over drinks and loud music but as the night getting older, our conversation shifted to Bangkok; things we love and hate from this city. “But what do you expect? Big wave of tourists are seen as chances. No one will give you smile for free. But it’s not entirely true, you should see Khaosan when the party ends.” My friend Linda replied. “Not exactly, come visit this place early in the morning!” She answered as she empty a can of Singha beer. Linda’s short comment was brought me to Khaosan Road the next morning, which was a total blessing! I was not thinking I could find something genuine to say about Khaosan Road but an honest face of a monk in pale orange robe walked barefoot and passed the empty road with copper pot in his hand altered my previous opinion. He slowly stopped when a woman in front of an empty bar make merit by offering him food. I spotted a reciprocation of an honest smile, things I could have been thinking of impossible to find in Khaosan if I wasn’t here this morning. Monk passing by Khaosan road to collect the donation from people in the morning. Time to clean up what left from last night. I could smell a fragrance of beer and light fire in the air was slowly fading as the day become brighter. An empty beer bottles were either lied or stood on the pedestrian, like a lone lover left alone after what seemed as an eternal night. I saw the same tuk-tuk driver stretched out on his passenger seat with his leg hanged out from the window and his face buried on his arm. I was eager to snap a picture but that simple gesture and silence shortly made me thinking that some things are better left alone as it is. If I wasn’t here last night, I won’t believe that I standing in what was an ocean of tourists. The road is naked and empty; it showed no show but real humanity. Khaosan Road is like the two face god Janus and none of the face has similarity except it’s attached to one single entity. When I was started to think that there’s no pause in Bangkok, this scenery made me rethinking. Even for a brief every show has an end, when the curtain is rolling down and the light goes off. Another show is begin, the real show without acting. And I am here to witness! < Previous And When The Words Dance! Next > Hai Dokter; Singsingkan Lengan Bajumu, Kejarlah Mimpi dan Matilah Sendiri! What a beautiful post. Love your blog. anyway… mau share info nih ttg foto kontes yg diadakan oleh Hisense Indonesia. ulasan yang menarik tentang sisi lain khaosan road, H. But unfortunately I can’t answer your question for one reason to love this city at night. Morning is the best time for sincerity. Banyak kejujuran yang saya temui di pagi hari. Dan tulisan mu ini berkorelasi dengan teori tersebut. Reblogged this on Rambut Kriwil.